A beauty trolley cart is among the most essential of salon and spa equipment. Trolley carts are available in a variety of styles and are made with different materials. 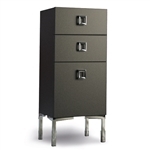 Source One Beauty carries solid wood carts, stainless steel carts, plastic trolley carts, and more. 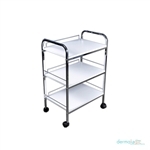 Some trolleys are available with pull out drawers to hide away products or equipment you do not wish to see and swinging doors that make storage and organization a breeze. Most of our utility carts are available on casters for mobility and functionality. Take advantage of a trolley cart to display and arrange your beauty supplies and equipment at a hands reach. And if you are looking for a specific brand then check out all we have from ALVA, CSC, Equipro, Gamma & Bross Spa, Paragon, Pibbs Industries, Salon Tuff, YCC and others.